I loved Julia Childs. Julia may have been the first person I'd ever seen cooking on a TV show. 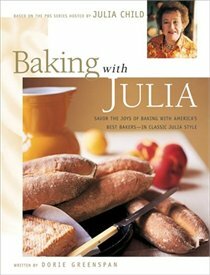 Just the mention of Julia evokes memories of my mom and I watching cooking shows together. We watched Julia's shows and we also watched the Galloping Gourmet (Graham Kerr) and any other cooking shows we could find for that matter. (this was before the food network--gasp!) A treat for us was when KCTS did cooking specials and we'd get to watch people cook all day. Well, since this is my first post ever for Tuesdays with Dorie, my options were wide open! I looked back on previous recipes that were done and this Lemon Loaf Cake caught my eye. Something simple yet full of flavour. Yes, it has been decided; this is going to be my first blog posting for Tuesdays with Dorie. Lemons zested and the kitchen is smelling lemony fresh. Now what to do with these zested lemons? What to do when life gives you lemons? Why make lemon curd of course! And Baking with Julia helped me out there too. As luck would have it, Baking with Julia has a Lemon Curd recipe. I've never made a curd before and I was pleased with how simple it was to make. And this lemon curd is a perfect mingling of lemon and sweetness. I'm thinking the curd would go great with so many things. (the buttermilk crumb muffins I'll be making for next tuesday's post, scones, toast, etc) Mmmm. Basic ingredients plus simple baking techniques equals one lovely Lemon Loaf Cake. Welcome to the group! I'm a newbie too (this is only my second week), but I'm already enjoying it immensely. That's a beautiful lemon loaf you have there - along with some beautiful lemon curd! I'm hoping to try this recipe myself sometime in December, and I hope it turns out as good-looking (and good-tasting!) as yours! Mmmmm . . . I love these lemony recipes. Welcome to the group! Wonderful recipe. Welcome to the group. We yet have to try the lemon loaf ourselves. Yours looks so delicious and makes us want to give it a try. Your lemon loaf has such a beautiful color! Glad to have you baking with us! Welcome to the TWD! You picked a great recipe to start with. I also loved the lemon loaf. Your curd looks great too, I've always wanted to try it. Great job! I'm a new member too. Your Lemon Loaf Cake is very nice. I made it too but with orange zests, it was so tasty, yours makes me want to make with lemon zest this time!! See you for next new culinary adventures. Orange zest! I'll have to try that next time. I am really enjoying the lemon loaf with lemon curd. Orange would be really good too.